Nicola Cliffe: On the road to rediscovery. Find Nicola at the Selvedge Fair, 1st December. Tucked away in a tiny sample box is a precious scrap of fabric that represents Nicola Cliffe’s determination to revive the ancient use of natural plant dyes to produce beautiful, hand-printed linens. The deep indigo of this early design was final confirmation that her technique worked, and the result was every bit as stunning as she had hoped. ‘My aim was to bring back the rich colours of the old days using sustainable plant dyes, and with that piece of fabric I knew I could do it,’ she said. The story actually began at school as she studied for art A-level and she longed to go on to Art College, but life took a different turn and instead she eventually studied for a chemistry degree and became a teacher. Over the years she found an outlet for her creative side through an interest in home interiors, crafts and a natural ability to make anything with a sewing machine; from quilts to curtains and clothes. Four years ago she suddenly had the opportunity to resign from teaching and take up a place at Chelsea College of Art and Design to study for an MA in sustainable textile design. The decision was life changing. For a year she had the luxury of devoting herself to everything she was passionate about and she credits the Chelsea screen printing technician, Margaret Campbell, for helping her master the complexities of the craft. The task ahead was daunting though and she had to ignore doubters within the industry who were unconvinced she could get the plant dyes scaled up to production levels. Undeterred, Nicola pressed on using her skills as a chemist to adjust the dyes, testing meticulously every step of the way to see how they responded to sunlight and wear and tear. She said: ‘It took me a long time to work out how to get the colours right. There were a lot of hours spent weighing things out and my experience as a chemist was invaluable.’ Generous advice from the makers at Rapture and Wright finally convinced her she was on the right track, and when those early experiments proved successful she was on her way. Nicola produces all the designs herself drawing from a love of nature, gardens and plants. The dyes come from all manner of plants and pigments including woad, madder, cutch, weld and charcoal, the colours merging together in a way synthetic dyes can’t. Reds, pinks, gold, blues and greys are a strong feature and all work well together like the plants they are derived from. 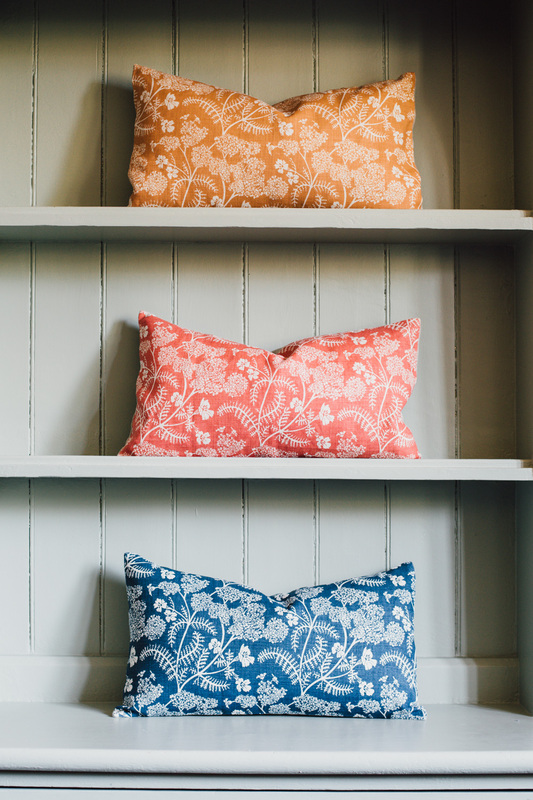 Designs are hand screen printed on 100 per cent linen and Nicola does all the production herself to ensure standards are maintained and her concern for the environment is protected. To test the market she exhibited at craft and furnishing fairs where her fabrics attracted attention from enthusiasts at home and abroad. The work was picked up by Helen Cormack, the force behind Tissus d’Helene, a boutique showroom at Chelsea Harbour, well known for specialising in artisanal fabrics and wallpapers. Stock comes from England, France, Belgium, Italy and America and Helen’s passion for prints is reflected in the hugely diverse ranges – most are hand blocked or hand screen printed.